& points in the side casing. 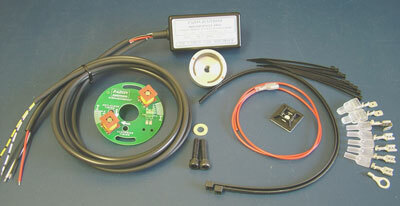 For C15/B40/Tiger Cub models fitted with a distributor, we recommend fitting our Energy Booster ignition unit. The Sure Fire system requires a minimum cranking speed before sparks are produced (typically 100-150rpm). This kit can be fitted to these models, but due to the potential of difficulty in kick-starting, we recommend fitting a digital ignition system, e.g. Smart Fire PD1 system. Due to the triggering method, our digital systems fire from zero rpm upwards, so more suited to bikes that are more difficult to kick-start. SURE-FIRE completely replaces the points, condenser and mechanical advance unit (ATU). "Thanks for your excellent unit. It has been fun"
The attached jpegs are of my just finished 1958 Mondial 175 Sprint. I am running it at crankshaft speed with one coil shorted out, and one magnet removed. But, as you explained on the phone, it advances the timing way too quickly. In fact at the slowest idle we can get, it is still at about 25 degrees. Makes it a little hard to start....tends to kick back!!!. I realize that this would be extra cost. Thanks for your excellent unit. It has been fun. PS. I have attached another picture of my "silly money" Mondial restoration!!!! * Pazon Ignitions made a special 6 volt ignition module for the Mondial; to give a wider advance range when used with the crank triggered single magnet & pickup arrangement, so removing the kick-back problem.